Geophysicists have obtained detailed three-dimensional images of a dangerous megathrust fault west of Costa Rica where two plates of the Earth's crust collide. The images reveal features of the fault surface, including long grooves or corrugations, that may determine how the fault will slip in an earthquake. The study, published February 12 in Nature Geoscience, focused on the Costa Rica subduction zone where the Cocos plate slowly dives beneath the overriding Caribbean plate. Variations in texture seen in different portions of the fault surface may explain why Costa Rica has complex, patchy earthquakes that do not seem to slip to shallow depths, unlike some other megathrust faults, said first author Joel Edwards, a Ph.D. candidate in Earth and planetary sciences at UC Santa Cruz. “Our new imagery shows large variability in the conditions along the megathrust, which may be linked to a number of earthquake phenomena we observe in the region,” Edwards said. Megathrusts, the huge continuous faults found in subduction zones, are responsible for Earth's largest earthquakes. Megathrust earthquakes can generate destructive tsunamis and are a serious hazard facing communities located near subduction zones. Understanding the mechanisms at work along these faults is vital for disaster management around the globe. Edwards worked with a team of geophysicists at UC Santa Cruz, the U.S. Geological Survey, the University of Texas-Austin, and McGill University to obtain 3-dimensional imagery of the fault interface using cutting-edge acoustic imaging technology. The long grooves, or corrugations, they observed along the interface are similar in size to those found along the base of fast-flowing glaciers and along some ocean ridges. The images also showed varying amounts of smoothness and corrugations on different portions of the fault. 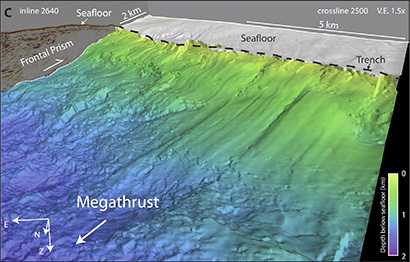 “This study produced an unprecedented view of the megathrust. Such 3-D information is critical to our ability to better understand megathrust faults and associated hazards worldwide,” said coauthor Jared Kluesner, a geophysicist at the USGS in Santa Cruz. The acoustic dataset was collected in spring 2011 on the academic research vessel Marcus G. Langseth. The ship towed an array of underwater microphones and sound sources behind it as it made a series of overlapping loops over the area of the fault. The data were processed over the next 2 years and have since been used in a number of studies looking at different aspects of the subduction zone process. This particular study focused on the interface between the sliding plates, which serves as a record of slip and slip processes. “The 3-D site selection was really good and the resulting acoustic dataset showed extraordinary detail,” said Edwards, noting that coauthor Emily Brodsky, professor of Earth and planetary sciences, was the first to recognize the corrugations. Such features had been observed in exposed faults on land, but never before in a fault deep beneath the surface. “I had an early rendition of the interface that vaguely showed long grooves, and during my qualifying exam, Brodsky saw them and asked, ‘are those corrugations! ?’ I didn’t know, but I knew they were real features. Slip-derived corrugations was a really neat hypothesis, and we dug into it after that,” he said. The area in this study had long been a target for drilling into the megathrust by the Costa Rica Seismic Project (CRISP). Coauthor Eli Silver, professor emeritus of Earth and planetary sciences at UC Santa Cruz, and others in the CRISP program decided to pursue a 3-D seismic study, which must precede any deep drilling, and the project was funded by the National Science Foundation in 2009. “At present, two drilling expeditions have been accomplished with shallower targets, and, though not yet scheduled, we are hopeful that the deep drilling will occur,” Silver said. Researchers hope to use similar imaging techniques on other subduction zones, such as the Cascadia margin along the northern U.S. west coast, where there is a long history of large megathrust earthquakes and related tsunamis. “Conducting this type of 3-D study along the Cascadia margin could provide us with key information along the megathrust, a plate boundary that poses a substantial hazard risk to the U.S. west coast,” Kluesner said. In addition to Edwards, Kluesner, Silver, and Brodksy, the coauthors of the paper include Danny Brothers at the USGS; Nathan Bangs at University of Texas, Austin; Jamie Kirkpatrick at McGill University; and Ruby Wood and Kristina Okamoto, both undergraduates at UC Santa Cruz.